Pennsylvania's state elections were held on November 4, 2008. Necessary primary elections were held on April 22. 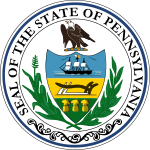 All 203 seats of the Pennsylvania House of Representatives, 25 seats of the Pennsylvania Senate, as well as the offices of Pennsylvania Treasurer, Pennsylvania Auditor General, and Pennsylvania Attorney General were up for election. Pennsylvania's Democratic Primary to award the state's 158 pledged delegates took place on April 22, 2008. Senator Barack Obama and Senator Hillary Clinton were the only 2 Democratic candidates on the ballot. According to official results from the primary, Clinton won 54.6% of the vote, and Obama took the remaining 45.4%. John McCain had already secured the majority of delegates for the Republican Party nomination, and captured 73% of Republican votes in the Pennsylvania primary. Republican turn-out was low, perhaps due in part to Republicans switching their registration to vote for Hillary Clinton and extend her candidacy as part of "Operation Chaos". See: Pennsylvania House of Representatives election, 2008 and Pennsylvania State Senate elections, 2008. The ballot question asked the voters to authorize the issuance of $400,000,000 in bonds for the "acquisition, repair, construction, reconstruction, rehabilitation, extension, expansion and improvement" of sewage treatment facilities and water supply systems. The money raised would be dispensed by the Pennsylvania Infrastructure Investment Authority. The measure passed with a healthy statewide margin and had a gained a majority in 64 of 67 counties. ^ Robinson, Jerry (2008-10-28). "Clean Water Referendum Will Help Repair Aging Infrastructure, Put People to Work, Says DEP Secretary". DEP Daily Update. Pennsylvania Department of Environmental Protection. Retrieved 2008-11-08. ^ "Regular Session 2007-2008 Senate Bill 1341". The Pennsylvania General Assembly. Legislative Data Processing Center. Retrieved 2008-11-08. ^ Ardo, Chuck (2008-11-05). "Majority of Voters in 64 of 67 Counties Show Support for Crucial Infrastructure Investment". Pennsylvania Office of the Governor. Retrieved 2008-11-08.